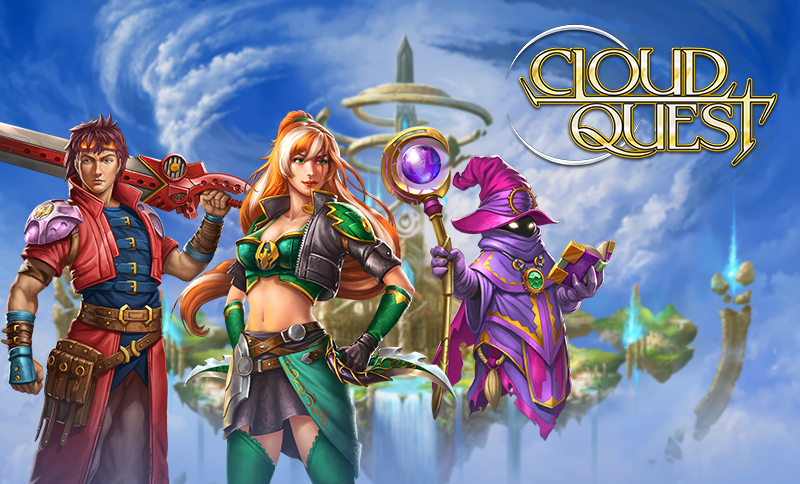 A Play’n GO release, Cloud Quest is a fantasy slot machine, with great graphics and a lot of monster fighting action. Once inside Cloud Quest, what you will notice is that the game is not quite like the others you might’ve tried, not just with its 5×5 design, but in the way it works as well. The slot’s theme is inspired by a fantasy world where cities float in the sky, hence the name Cloud Quest. There are heroes that fight monsters as well, and which advance in level as they do so, during the special features. The game is very different from the ones you’re used to, and it can be a lot of fun. There are no fixed paylines here, or ways to win for that matter, the combinations forming in any direction. The big prize sits at $10,000. The game has an Anime like appearance, which looks great, and which features the city in the clouds right behind the game area. On the reels, there are images of heroes, of weapons, spell books, potions and other fantasy related images. The bets you place are all on a horizontal line, and you use the Plus and Minus signs to go to the one you like. Alternatively you can just click on the value you’re comfortable with. It’s the total bet that you’re picking, and the range is between $0.10 and $40. To form a combination, all you need is for 3 or more matching icons to appear next to each other, either vertically, diagonally or horizontally. Once the combo forms, it pays you and the symbols are cleared from the screen, letting new ones come take their place. Getting three symbols to form a combo will not only clear them, but will also leave behind a wild symbol, in the spot occupied by the symbol from the middle. The number of such symbols that you get in one round counts, being used as a way to fill up a power meter, shown on the right side of the screen. Get three to five of these, and you get a re-spin for free, with a random power attached. To get the Bonus feature, you need to clear a row of symbols, which has the Bonus border around it that round. A fight between your hero and a monster will start next, and you win free bonus spins from it. It’s a game that tries to do as many things differently as it can, and it succeeds at being a lot of fun thanks to that effort. I loved its features and design.